Well it has been 4 years for this version of The Dee Zone. In honor of that I thought I would share some of the highlights from the past 4 years. 09 Nov 2007: A Well Rounded Education? 11 Feb 2008: Why Roger Clemens Will Never Be as Great A Pitcher as Nolan Ryan!!! This is from my first Sky Watch Friday. It is still one of my favorite photos. 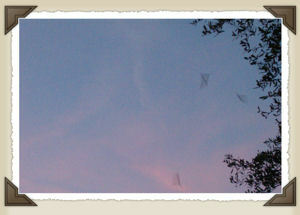 The bats look more like transparent little kites. They are fruit bats at the U.F. bat house. See more, including the sky shot.